If anyone says knitting socks on two circular needles is easy, then they obviously don’t remember their first pair. I think I fried my brain trying to figure this technique out yesterday. One needle for the fronts and the second for the backs was hard for me to visualize. Then I had to figure out how to get each sock in the right place on the needles. I tried the long tail cast-on and realized right off it would be too tight for socks. So I cast on using the cable style. The one thing that is bothersome at the moment is the cast-on edge is inside out. It is a minor quibble. I tried the sock over my heel and the edge stretches nicely which is the most important issue. So far the yarn color changes are matching from one sock to the next. All in all a good start of “glynis”, which is the first pattern in Cookie’s book. Now the next big task is finishing them before I start working on something else. This entry was posted on Monday, April 13th, 2009 at 3:00 am and is filed under Knitting and Yarn. Tagged: Knitting, Yarn. You can feed this entry. You can leave a response, or trackback from your own site. 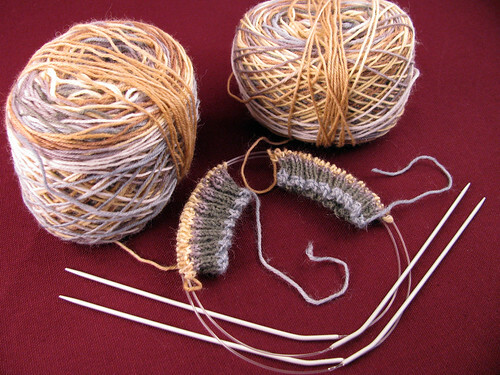 For me, the most difficult part of 2 socks on one circular is the moving around of the needles and the yarn. Is that easier with 2 on 2? The yarn looks like it’s stripes very nicely.